Hounded by watchmen, trolls, goblins, and a relentless bounty hunter, 13-year-old Jetsam dreams of the day heâ€™ll no longer have to run for his life. In the mountain city of Dwim-Halloe, Eidryn and Elvar were born twins to teachers at the cityâ€™s revered School of Magic. When the new king outlawed magic, the boysâ€™ parents were murdered. Their deaths forfeited the twins' magical birthright and made them homeless fugitives. Rescued by an orphan gang, the fleeing twins were nicknamed Flotsam and Jetsam. To survive as outcasts, the orphans scavenge and pilfer nightly. Their last risky foray sent them fleeing for their lives into an unfamiliar cavern. Now the boys are lost deep underground where they encounter a strange beast that will change their lives forever and begin a harrowing journey for their ultimate survival. 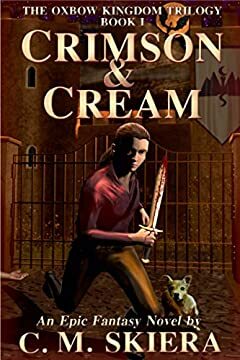 Crimson & Cream is a classic swords & sorcery, coming-of-age adventure that recounts Jetsamâ€™s tale of flight and discovery as the fugitive orphan unravels his tortured past while securing his tenuous future.